Pickled Potpourri Designs: It's the Most Wonderful Time of the Year! It's the Most Wonderful Time of the Year! I love the Christmas season. I love the songs, the anticipation, the decking of the halls and the baking. Most of all, I love the family time. There's food, games and the normal dysfunction that any family has, big or small. Regardless of any drama, we try to find time to be together and that's a good thing. So, to celebrate this magical time, I have two different digi sets to share with you this month. 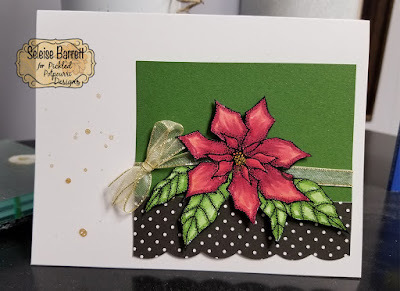 The first is Simple Poinsettia. It is a gorgeous flower that comes in a variety of colors. My favorites are pink and red so decided to play with the beautiful digi in those two colors. First up is pink. 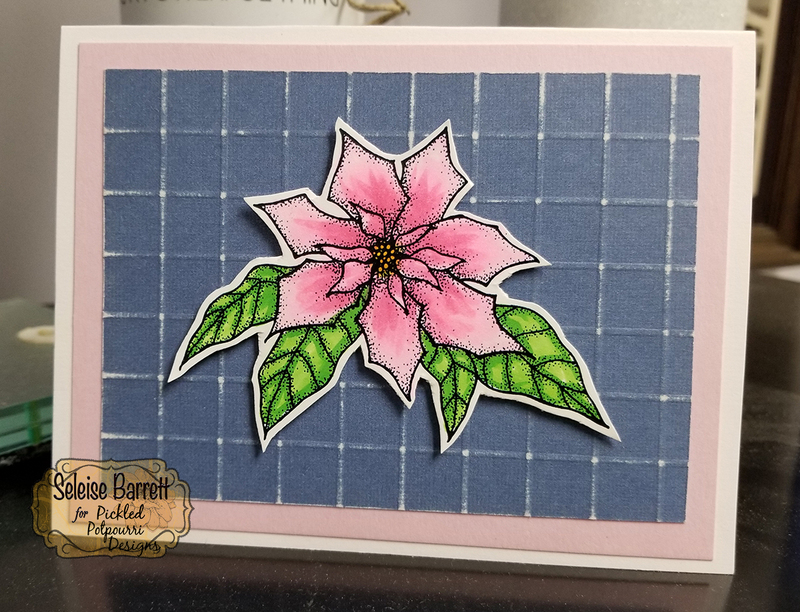 The pink poinsettia is colored with copics and popped up on a scored background. I love how it pops against the distressed edges of the blue white-core cardstock. Here is the same Simple Poinsettia in red. It shines in a simple focal point on the bottom right side of the card. Some dribbles of gold shimmer paint and gold ribbon highlight the floral element. It's a fun way to dress up a card. 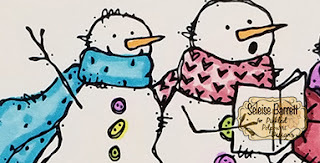 In addition to the floral goodness of the poinsettia, I adore snowmen! I have paintings and figurines up all year long. I couldn't make a Christmas post without using Heart Sings which is one of my all-time favorite images. 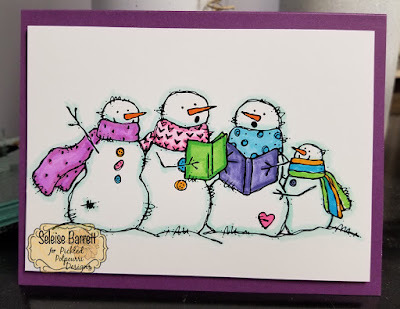 It combines music and snowmen - my favorite things! The beauty of digi images is that you can print them whatever size you want. 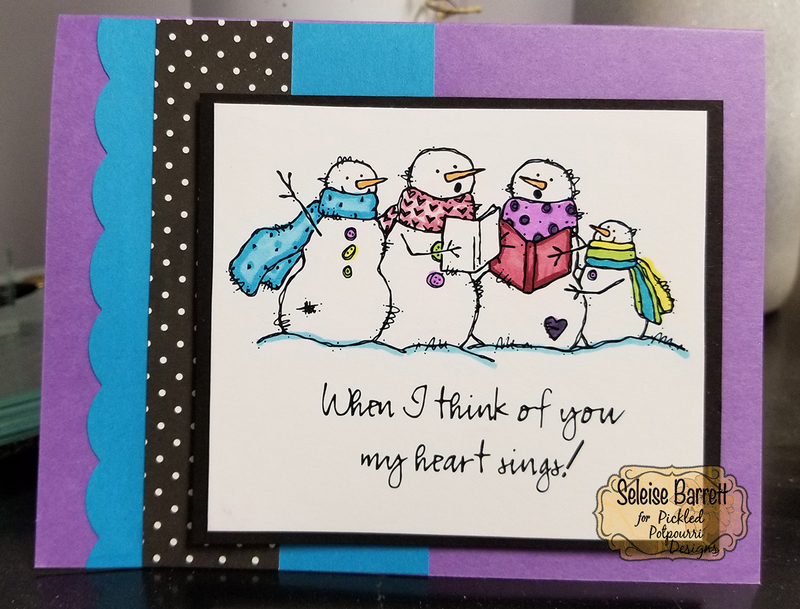 The first is printed to fill the front of the card and the 2nd is printed with the sentiment to be a focal image on the card. It's awesome to have that flexibility. You could print the first of a size to fill a frame and make a print to hang in your living room. You could also shrink it down and make a tag for a backpack or gift. So fun! I used copics to color up the images and had fun choosing the colors of the scarves and books. Aren't they fun?! The image makes me smile. 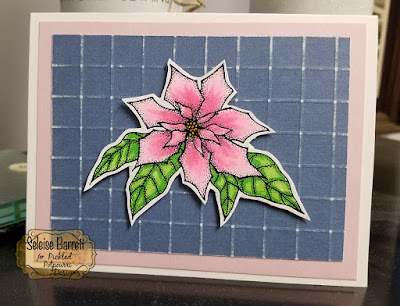 I encourage you to visit Pickled PotPourri Designs to find these and many other lovely digital stamps to use in your own crafty endeavors.